Our nursery is the most advanced of its type in Australia and one of the most sophisticated in the world. The First Stage nursery covers a total area of 25,000 sq m and can cater for up to 4.8 million seedlings at any point in time. It provides a sheltered, controlled environment for the plants during their most vulnerable early stage of growth. Specialized open, hardening areas are provided for the plants just prior to shipping and field transplanting. All of our plants are assessed at multiple points during their initial growth stage for robustness. This allows us to select the strongest Oldman saltbush seedlings for field planting, ensuring that Grazing Management Systems products are the most effective available. They will provide you with the highest possible survival and establishment rates, even in harsh conditions. The watering system we utilize is a series of sensor controlled, mobile units that water and fertilize the seedlings on a specially pre-determined basis. This permits an optimized and even distribution of water and nutrients through the initial growth stage of the seedlings, vital for the best possible establishment. A seedling which is grown too quickly is "soft" - with a fair probability of failure at transplanting, or with poor vigour which slows initial growth in the field. Thus, it is vital that plant growth is strong when seedlings are dispatched. This is why we have spent large amounts of capital in optimising our nursery's growing structures, so the seedlings you receive will work. The temperatures at the nursery range from -5o C to 48o C during the seedlings growth period. When they reach your property, they have been well hardened and can cope with adverse climatic conditions far more effectively than otherwise possible. There are essentially 3 basic stages to our process. Oldman saltbush seeding in the nursery commences in October and goes right through until February of each year. Each growing tray (a special Styrofoam unit of 16 x 16 cells) sown has a quantity of seed placed into each cell to try and ensure that at least one plant per cell is achieved. As we are dealing with native plants that share a very broad genetic base, seed performance is quite variable. We have found that by loading the cells with seed, we can compensate for the highly variable germination rate. The down side is, of course, that considerable labour time is needed to thin the cells with surplus plants and transfer excess seedlings into any cells without a successfully sprouting plant. However, this has to be done as the most costly cell to grow in the nursery is the cell that has no plant. 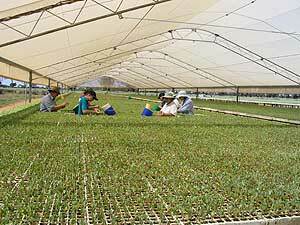 After germination, the seedlings are placed into a controlled, sheltered growing environment for 10 to 12 weeks. After this the seedlings are strong enough to be then placed on outside growing benches, where they are further hardened over a further 12 to 16 weeks. Regular watering, fertilizing, pruning and weeding operations are carried out during this period. Just prior to dispatch, the plants in the nursery are pre-fertilized and the leaves air dried so as to remain at their absolute peek during transit to the field for planting. To assist with improving the speed of delivery and transplanting, the individual seedlings are taken from their growing trays and packed into specially developed waxed cardboard boxes. Again at this point, they are graded for strength and quality. Each box holds 600 fully primed seedlings ready for the field. Our experience has shown that the boxing process is critical: it permits the quickest and easiest handling of the plants in the field (saving you time and labour) and allows for the greatest number of plants to be put into the ground in the shortest possible period. This attention to packing becomes a real advantage for exploiting the optimal window of opportunity for when conditions a best for transplanting. Furthermore, boxing the plants provides the most cost effective way to transport the seedlings and saves on the unnecessary expense of having to return growing trays to the nursery. Most deliveries are made by Grazing Management Systems direct to the properties or loaded onto commercial carriers organised by us. Whatever the situation, Grazing Management Systems is responsible for getting the plants safely to your property or to a convenient collecting point. This is a small part of our service. But together with all our knowledge, experience and ability to transfer that to our clients, it adds up to a total supply chain that you can rely on.